What kind of TT bike is Levi riding? It certainly looks like a Walser. Interestingly, one of my coaches is always preaching a flat back, but as I look at the better time trialists, it seems that a rounded (aerfoil like) back it the way to go. I have to reasses my positiion on the bike. I'd be more inclined to reassess whether I'd ride time trials. I still think that flat bask is the best. 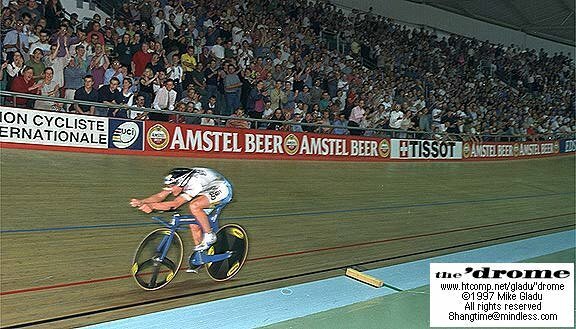 I think I remember reading somewhere about how lance was saying or someone was commenting on lances chances at the hour record, and if he could get his back as flat as Chris Boardman, then given the talent lance has, in theory, he would be able to set an amazing time. I think that’s how it went. So I think the hump/flat back is more anatomical than anything. A lot of guys could get flatter, but then they aren't able to breathe as well, You have to find the fastest balance between drag and the ability to produce the watts. I love TT's, and am scheduled to do about a dozen of them in the months of October and November. I am chomping at the bit, and cannot wait to feel that marvelous pain again! Levi and Lance both have very rounded backs, and they sure have success. It makes sense from the perspective of physics, because when the back is shaped like an airfoil, I would think one would cut through the air better the faster you go. They always stress forward pelvic tilt to me which encourages a flatter back. Lance's back is so weird because of some accident he had as a child - or he was born that way, I don't remember. But he does not have a normal back. It gives me an idea for a new product. I shall call it "LanceBack." You wear it under your jersey, and it straps around your chest. It gives you the exact shape of Lance's back for time trialing. I'll be rich! Boardman and Peter Keen realised this in the early 90s. Obvioulsy the lower and flatter you go, the less frontal area you present to the wind. But soon enough, you won't be able to breathe or see!! Didn't Lance have a special TT helmet before the new crash rules took effect? I remember David Millar having one too. Both riders were sponsored by Giro. looks like you guys are right. can someone enlighten me as to the point of the the indention on the bottom of the seat tube above the BB? looks like a little recess for the front derailluer to hide in when he's on the inner chain ring. A lot of these TT bikes have a very low Q factor, or narrow BB to be more aerodynamic. The Chain rings are probably very close to the seat tube for Aerodynamics. Anyone have a head-on shot of this bike? I have to agree and say that the rounded back is better aerodynamically. I read that Bobby Julich will often wear a filled Camelback under his jersey to give himself an artificial hump. Have you thought of doing something like that? Also....I'd love to give those O-Symetric chain rings a trial run. here's a photo of Bobby J doing a time trial. It is obvious in the photo that he has a Camelback under the jersey....and it aint there for hydration. Bobby always uses on for TT's. Numerous pics on CSC's site shows him in TT's and TTT's with the tell tale blue spigot (sp?) around his shoulders. Actually it is there for hydration. On the camelback site they have information and pictures about it. "Julich to assist company’s R&D and Promotional Efforts in the Cycling Category "
http://www.camelbak.com/s_images/bobbyjulich2.jpg that is an image of Julich with the spigot poking out the front of his jersey. Didn't Lance's early Trek TT frames have a built in bladder with a little hosepipe sticking up too? ?